After a 7 year hiatus, the Ford Ranger returns to American soil for 2019. 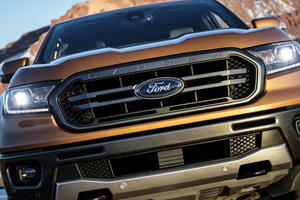 The mid-size pickup is set to rival the Honda Ridgeline, Toyota Tacoma, and Chevrolet Colorado, looking to do so with a 2.3-liter EcoBoost turbo-4 developing 270 horsepower and 320 lb-ft of torque, mated to a 10-speed automatic gearbox and the choice between a 4x2 and 4x4 drivetrain with low range and optional locking rear axle. The SuperCrew, with its 5-foot box starts at $26,520 in XL trim. XLT and Lariat trims up the ante to a final price of $38,385 before options, but with SYNC 3, leather upholstery, and LED headlamps, you’ll be wanting for little. In 2011, Ford decided to leave the compact pickup market and kill off the Ranger in the United States. Now, 8 years later, with much different competition. It’s not only important for the new truck to be good, but it’s vital that the Ranger resonates with the right customer in the fast-growing segment. San Diego was the city of choice for Ford to invite us to experience the all-new Ranger. Built on the global Ranger platform, the truck has some , namely its fully-boxed steel frame and powerplant. The styling of the US-spec truck sticks close to the global Ranger, however it comes with two different bed lengths and cab configurations. The bed length is determined by the cab you get. There is a SuperCab with two short rear doors and a shorter overall cab. There’s then a SuperCrew with four proper doors and ample rear seat room. If you get the SuperCab you get the 6-foot bed, if you get the SuperCrew you get a 5-foot bed. Halogen headlights are standard on XL and XLT trims while the Lariat gets LED lights. Out back, the taillights are LED on XLT and above. The work truck XL trim can be had with steel wheels which actually look pretty good. Some nice touches on the outside are the steel front and rear bumpers, a feature customers have asked for, as well as a hood that has gas struts to keep itself up without the need for a prop rod. The tailgate, though it lacks dampening, is lightweight because it’s constructed from aluminum. It also locks with the power door locks to prevent theft. A 2.3-liter EcoBoost four-cylinder turbo is the only engine choice in the new Ranger. In this guise, it makes 270 horsepower and 310 lb-ft of torque. While it’s based on the 2.3L in the Mustang, technical changes – including new cams – were made to lower the torque curve to better serve the needs of truck buyers. Only one engine? That’s heresy, right? Ford’s F-150 and Ranger retail marketing manager Brian Bell believes otherwise. “The 2.3L is an ‘and’ engine. You get the power ‘and’ efficiency. It’s no compromise,” he tells us. Indeed, it’s an interesting approach to offer the same engine in the base truck and the premium offering. It means that if you purchase a base truck at $25,395 including destination, you get the top-end engine. The difference between an XL and a Lariat is equipment, not function. Whether or not customers take to that approach has yet to be seen, but what I can tell you is that the 2.3L is fantastic in this truck. Mated to Ford’s 10-speed automatic that appears also in the F-150, the truck never seems to be hunting for gears. There’s a hint of turbo lag when you first put your foot down, but acceleration is brisk, and the engine feels much more stout than the V6 offerings in the Tacoma and Colorado. It’ll out tow those trucks too, with a gas tow rating of 7,500 on both the 2WD and 4WD trucks with the tow package. Only the Jeep Gladiator will have a better tow rating when it ships next year some time. The 2.3L is relatively fuel efficient, too. On a drive program with multiple people driving each truck it’s hard to get a real-world number, but Ford’s EPA claims are 21/26/24 mpg city/highway/combined for the 2WD truck and 20/24/22 mpg city/highway/combined for the 4WD truck. Inside, plastics are well put together and most are soft to the touch. They seem to be higher quality in the Lariat trim over the XLT, but none ever feel particularly cheap. The upper-level Lariat trim also has a fancy instrument cluster that shows navigation and radio data, SYNC 3 with support for Android Auto and Apple CarPlay, a Wi-Fi hotspot supporting 10 devices, dual zone climate control and heated seats. Blind spot monitoring is available, which also covers the trailer if attached, and adaptive cruise control comes with the tech package that has full stop-and-go capability. Front seats have power adjustment on both driver and passenger side for length, but sadly are manually adjusted for seatback rake. Also, on the depressingly manual side is the sliding rear window that isn’t powered. The SuperCab rear seats are nothing more than jump seats in an emergency, but the rear seats in the SuperCrew have a ton of space. I’m not a particularly tall guy at 5’10”, but I am on the chunky side and in a comfortable driving position a 6’3” guy was able to sit behind me in comfort. Ford says it’s only 4 inches more legroom than in the SuperCab, but the 34.5 inches of legroom in the SuperCrew is significant. For the 6-foot bed, Ford claims 51.8 cu/ft of cargo volume. In the 5-foot bed, that drops to 43.3 cu/ft. There are tie downs In the bed to help secure cargo, and an optional bed liner and tonneau cover help protect the truck and the cargo. While the rear seats aren’t great for passengers on the SuperCab configuration, the rear area is great for storage while giving the front passengers more room to recline their seats. For the purpose of our drive, my drive partner and I hopped into a Lariat FX4 loaded with most of the options. From behind the wheel, it was immediately apparent that the team had done a fantastic job at improving noise, vibration, and harshness (NVH) with the new truck. The Ranger feels solid with little road noise; even the off-road tires were relatively quiet. Steering is also spot on. While there isn’t as much feedback as there is on Tacoma, the Ranger’s steering provides more information than Colorado with more weighting. On an off-road course set up by Ford, the steering was nearly perfect. The FX4 package is code for “off-road” in the Ford universe, and our truck was set up for that. While not a Range Raptor by any stretch, the FX4 includes skid plates and a forward bash plate to protect the underside. Different suspension tuning also is designed for the off-road adventures to the campsite. Ranger has several different terrain settings, and the FX4 package adds Trail Control to the mix. 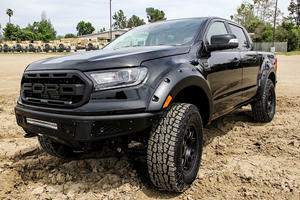 Ford describes it as an off-road cruise control, and compares it in functionality to the CRAWL Control on the Tacoma TRD Off-Road and TRD Pro. Unlike the Toyota system that only works in 4-LO, the Trail Control on Ranger works in all drive configurations. Basically, the driver sets a speed from the cruise control interface and the truck does the rest. It adjusts the brakes, throttle and traction control settings to make sure you can climb just about any surface. The driver just needs to steer. It’s an impressive system that is quieter in operation than Toyota’s CRAWL setup. While not necessary for an experienced off-roader, the system should lower the stress of folks who might not have a ton of experience. Ranger is surprisingly capable off-road. The size of the truck combined with the stiffness of the chassis is really helpful. Additionally, the global Ranger is designed for off-road bits, so a ton of that DNA is carried over to this version of the truck. I’d argue that outside of ZR2 and TRD Pro, the Ranger is the best off-road midsize truck on sale. At least until the Jeep Gladiator shows up. Ranger is for the person who needs to drive somewhere to do activities. It might be towing a side-by-side to the dunes. It might be towing a boat to the lake. It might be towing kayaks to the river. It’s a tool to get to the destination, but not the destination itself. That’s what Ford’s internal research tells them about midsize truck buyers. They’re a more active group who are looking to go somewhere on the weekend and have fun, and their truck is a tool to help them get there. It’s unusual to experience problems on a media program with trucks that are looked over with a fine-tooth comb before the media get on board, and the Ranger program was no exception. That being said, I don’t expect there to be any reliability problems with the new truck. It’s based on a test global platform with an engine that’s been in production for a while. Sure, the Ranger is a new truck in the US but many of the components aren’t new to Ford. A 2WD XL base truck starts at $25,395 with the $1,095 delivery charge. To get that truck with four-wheel drive, expect to shell out $29,555. The mid-grade XLT starts at $29,035 for 2WD and $33,035 for 4WD. 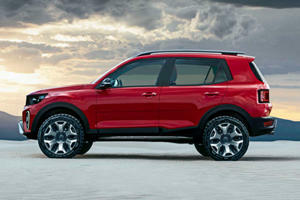 Top trim Lariat models start at $33,305 for 2WD and $37,305 for 4WD. All trucks and trims come with the same engine and the 10-speed automatic transmission. No manual transmission is available. At $46,090 including the $1,095 delivery charge for our test model, the truck isn’t cheap. In fact, it’s pricier than Tacoma TRD Pro and Colorado ZR2, both more capable off-road trucks, but . For fans of the old Ranger, it might seem like Ford is abandoning them. The last Ranger was a basic compact truck. The new Ranger is not that. It’s designed to go after someone who wants or needs a utility in their life, where a Tacoma might be their first choice. 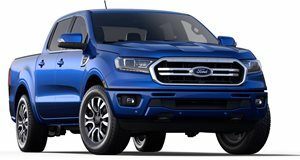 Ford still offers a basic Ranger that still has more features and comfort than the 2011 model at any price, if you want it. Heck, they’ll even sell you a box delete version if you need a little work truck. The meat and potatoes customer is looking for a midsize truck that can fit in the garage, handle well in the city, get relatively decent fuel economy and deliver them to their fun on the weekend. The Ranger ticks all these boxes. It’s now up to the buyers to see if the Ranger is a compelling alternative to the Toyota Tacoma. We happen to think it is.